Posted in Electric Power-assisted Bikes. Rear-wheel-drive to get you up any hill. Intergrated front and rear lights. Suspension seatpost. Extra plush seat. Upgraded Shimano Altus 8 shifters. Stepthru frame for ease of use. These bikes ride so well… very balanced, not heavy-feeling like many ebikes. Shimano 8 speed cassette 11-34 gear set, with shimano revo twist grip shifter. 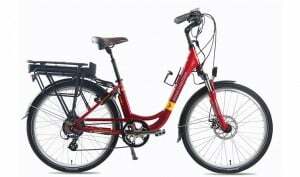 Alloy stepthru frame and colour-matched alloy rims. Polypropelene guards with heavyduty stays. CST Commuter tires, Kevlar guard, 26 X 1.9. Centre-mounted adjustable kickstand. Heavyduty rear battery rack, with elastic for luggage. Velo plush comfort seat. Semi ‘cowhorn’ comfort handle bars for a relaxed, upright ride posture. Adjustable headset… adjust the handlebar height for different ride styles. Total Weight 25.5kg (includes battery).